India will in all likelihood assist Afghanistan in building another dam – this time on the Kabul river basin – which will provide over two million Kabul residents with potable water. According to the Afghan Ministry of Energy and Water, work on the World Bank-funded Shahtoot Dam project, in the Chahar Asiab district, is expected to start in about a month. Ministry officials said a meeting was held in New Delhi recently between Afghan and Indian officials, and India indicated its willingness to help build the dam. A feasibility study was reportedly finalized in 2012 but now the issue of land acquisition is being worked on. The ministry said once this has been finalized, the construction phase will begin. Ghafori also said that while the ministry resolves the land acquisition issue, the urban development ministry will conduct an environmental impact study. Officials said the estimated cost of the dam will be about $236 million and will take about three years to complete. This dam would also allow for irrigation systems to cover 4,000 hectares of land in the Charasiab and Khairabad districts. Meanwhile, Hameedullah Yalani, the director of canalization and water supply said the department had called for tenders for a number of phases, also regarding irrigation of farmland. “Foreign companies have sent us their applications. We agreed with the energy and water ministry that we would start the construction of the water supply network and government should startthe construction of the dam. I am sure that the water network and construction of the dam will be completed at the same time. If so we will inaugurate them together,” Yalani said. Residents of Lalandar area, an area near Shahtoot dam, meanwhile welcomed the dam project but said government would first need to resolve the issue of land acquisition. They said government needs to purchase the land from them before starting construction work on the project. “We are happy that Shahtoot dam will be built but we want our rights and government must pay us for our land,” Ahmazai, a resident of the area said. Another resident, Saleh Mohammad, said: “If around 700 families lose their land here, it is Ok, because five million people will benefit (from water) in Kabul. But government should pay us (for our land). Once complete, officials said the dam will hold 146 million cubic meters of potable water for two million people in Kabul and irrigation water for over 400,000 acres of land. This announcement comes after the National Disaster Management Authority (ANDMA) recently warned that underground water reserves in Kabul will dry up within the next 10 years amid an increasing demand and the overuse of water in the capital city. Thirty-two million cubic meters of water is used from Kabul’s underground water reserves every year while the capacity of the city’s water is 29 million cubic meters in a year, head of the authority, Najib Aqa Fahim, said recently. There are currently over 200,000 wells in Kabul, he said, adding that the drop in ground water was “a crisis” for residents. Shahabuddin, 18, a farmer in Kabul’s Sarai Khwaja district, said the lack of water has affected his business. Meanwhile in the Asia Foundation’s recent Survey of the Afghan People, it revealed that there are rising concerns over water shortages in Kabul province. Each year, the survey asks Afghans about their biggest problems in their local areas, and in 2017, significantly more (26%) Afghans in Kabul province reported access to drinking water as the biggest problem compared to the previous year (19%). The survey also shows that over time, at the national level, access to drinking water is consistently one of the most cited problems Afghans report in their local area. In addition, findings from the survey reveal that awareness about drinking water projects such as new wells or piped water systems drives optimism about the direction of the country. Among the respondents who report that they know about a drinking water project, 41.7 percent say that the country is moving in the right direction, compared to 29.9 percent of those who don’t know about the project. Importantly, those who see the country moving in the right direction are significantly less likely (35.0%) to report a desire to leave the country than those who do not (41.4%). Since the NUG formed in 2014, President Ashraf Ghani has made water management and building dams a priority for economic growth and development. In 2016, Ghani and Indian Prime Minister inaugurated the Indian-funded “Friendship Dam” in Heart Province, which is expected to irrigate over 80,000 hectares of land and provide electricity to thousands of homes in the western Afghan province of Herat. The Asia Foundation meanwhile said recently that more needs to be done, including policy solutions that promote water use efficiency at the consumer level through recycling, wastewater management, water treatment, the harvesting of surface water, and the monitoring of groundwater extraction methods at the ministry level. 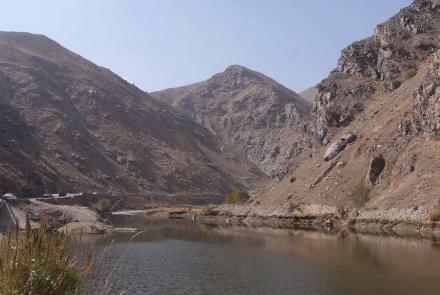 To fight the misuse of water, the government needs to step up efforts to promote public awareness by developing a national campaign in Kabul, but also in rural and urban areas throughout the country, the foundation said.